From the boom of virtual reality to the explosion of new design tools, product design sure had it’s turn on the stage this year. But before you start getting too excited about switching off and turning a new leaf next year, remember the old saying “Those who fail to learn from history are doomed to repeat it”. That could be embarrassing. As editor of Product Design Weekly, a weekly digest of news, articles, showcases and resources on product design, my teammates and I have read literally thousands of articles on design in search of some gems to share each week – a total of 424 of them so far this year. Here’s a summary of our 2015: Product Design Year in Review. It’s official. We’re in love with thinking about new design frontiers. VR feels close enough to touch, and many of you probably already have. It’s been a long time coming and we’ve been swept up in talking about it. If it wasn’t virtual reality, it was artificial intelligence, messaging as an interface, wearables or self-driving cars. From the how-to’s like Immersive design: Learning to let go of the screen to the musings on our tech-augmented lives like Life with my robot secretary and Distractions, talk of the frontiers of design captured our imaginations. Instead of hearing about design from the newest startups and world renowned creative agencies, we saw tech giants like Google and Apple stand front and centre of design this year. Their highly orchestrated courting of designers reached dizzying heights, contributing a staggering amount to the landscape and practices of product design. The top three picks from our on the giants from our Year in Review are: Mobile is not a neutral platform, The shape of things to come and Facebook’s Four business design principles for crafting elegant tools. Without question, most of the noise around product design is about the practices and processes of the day to day design grind. And this year was no different. But amongst the noise and chaos, some great themes, patterns, tools and ideas emerged. Thoughtful essays like Chimero’s on ‘the web’s grain’ gave new ways of looking at the medium we’re designing for. Techniques like Google’s Design Sprints gave us methods for revitalizing our everyday grind and challenged our penchant for hiding behind our screens. We talked more about the value and methods of prototyping than ever before, and debated how to make our design practices more collaborative. If you’ve only got time for one, make it The Web’s Grain. The least anticipated and arguably most memorable opinion this year came from Jennifer Daniel, who took the podium at a Creative Mornings talk and bluntly, hilariously, reminded us that design, despite all our fantasies, is capitalism. At a point in the year where we were all getting pretty tired of seeing so-called design unicorns or disruptors scratching their beards, Jennifer’s wake up call on Design is Capitalism brought us back to Earth. It takes a great team to make great products. Within that, design, and designers have an increasingly important role to play, but creating successful digital products is still invariably a team game. It was interesting to learn from this year’s tools surveys that most designers resort to HTML and CSS to create their prototypes. The results of confirmed it. But what started out as a few new design tools hitting the market, by the end of the year had turned into a tsunami. Newcomers launched their early products while old incumbents released their marketing videos with promises of what’s ‘coming soon’. Shots were fired, and there’s no doubt the tools wars have begun. Catch up on the state of design tools with Where we are today with UX prototyping software and Design has changed, but the tools have not. 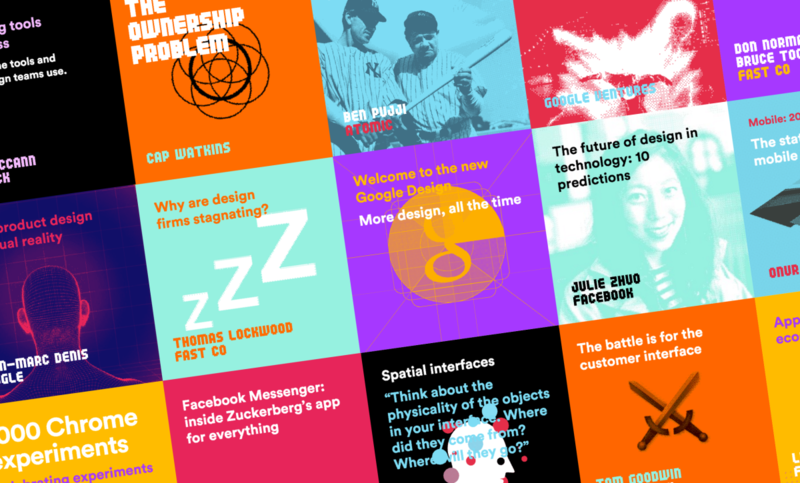 Check out Atomic’s full 2015 Product Design Year in Review – there’s lots more to catch up on.